Prepare a pie crust and refrigerate it. Prepare the fruits: peel, core, and slice them. They will collapse during baking so don’t slice them too small. In a large skillet, melt the butter and add the fruits. Once the butter has melted, increase heat until the fruit juice gets bubbly. Then add: cinnamon stick, ground cinnamon, cloves, nutmeg, and brown sugar. Once the sugar has melted and everything is mixed in well, reduce heat, and simmer for at least 15 minutes, stirring occasionally. Cut pastry to size and place into ramequins. Set ramequins on cookie tray. (Save the remaining pastry for another use and refrigerate). 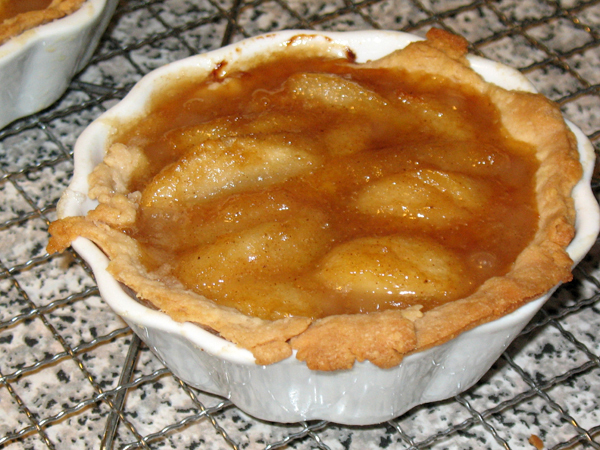 Discard cinnamon stick, and ladle fruit mixture into crust. Bake 30 minutes, and cool on wire rack at least 20 min.